218 pages | 25 B/W Illus. The embodied directedness of human practice has long been neglected in critical socio-spatial theory, in favor of analyses focused upon distance and proximity. 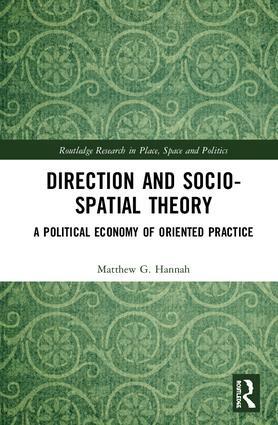 This book illustrates the absence of a sense for direction in much theoretical discourse and lays important groundwork for redressing this lacuna in socio-spatial theory. Many accounts of the social world are incomplete, or are increasingly out of step with recent developments of neoliberal capitalism. Not least through new technological mediations of production and consumption, the much-discussed waning of the importance of physical distance has been matched by the increasing centrality of turning from one thing to another as a basic way in which lives are structured and occupied. A sensibility for embodied processes of turning, and for phenomena of direction more generally, is urgently needed. Chapters develop wide-ranging and original engagements with the arguments of Sara Ahmed, Jonathan Beller, Edmund Husserl, Martin Heidegger, Virginia Held, Bernard Stiegler, Theodore Schatzki, Rahel Jaeggi, Hartmut Rosa and David Harvey. This book reinterprets practice, embodiment, alienation, reification, social reproduction and ethical responsibility from a directional perspective. It will be a new valuable resource and reference for political and social geography students, as well as sociologists and anthropologists. Matthew G. Hannah holds the Chair in Cultural Geography at the University of Bayreuth, Germany. His research has addressed relations between constructions of space, power and state knowledge, as well as various aspects of social theory and historical geography. His previous books include Governmentality and the Mastery of Territory in Nineteenth Century America (2000) and Dark Territory in the Information Age: Learning from the West German Census Controversies of the 1980s (2010).